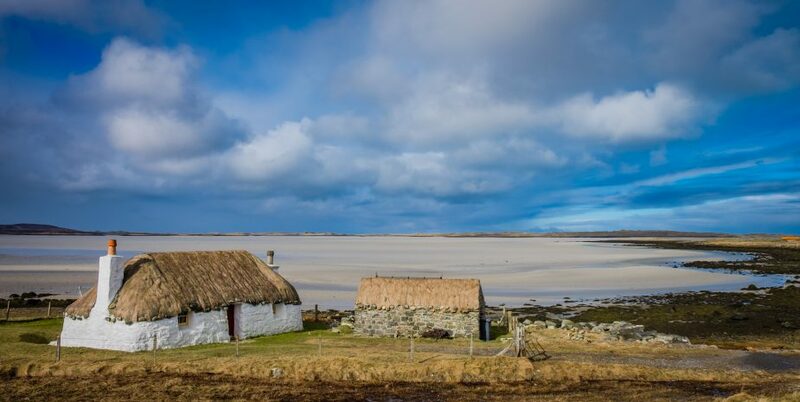 Wherever you are in North Uist, we’ve found it’s always worth turning down small side roads. They often lead to interesting places and give a real taste of local life. 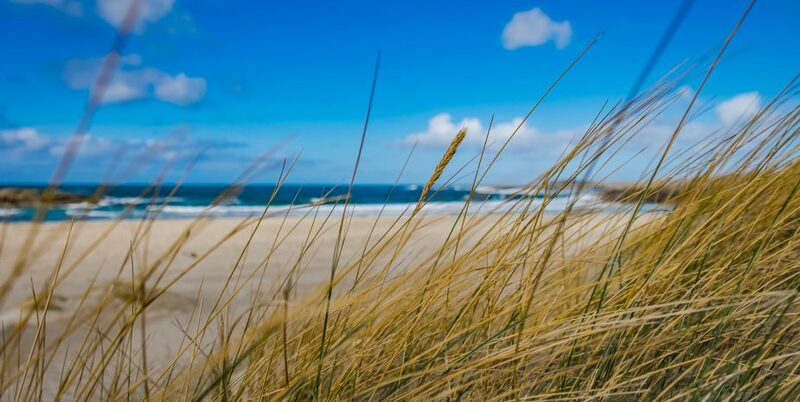 The Uists have lots of deserted beaches, tiny villages and areas teeming with wildlife await your discovery. The tiny island of Berneray is the landing point for the short Calmac ferry crossing to or from Harris. 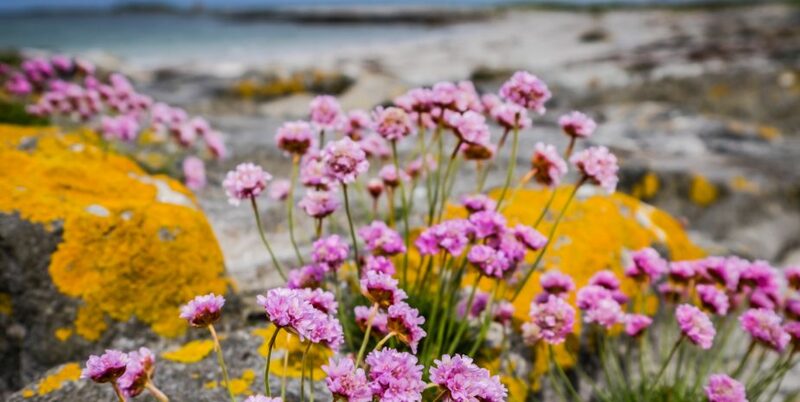 Its village (with a convenient tea-shop) lines the shore of a natural harbour, and there are superb beaches on three sides of the island, backed by machair with colourful, summer flowers. There’s also an interesting little museum that’s occasionally open. Be sure to spend an hour or two here, before or after crossing the short causeway, to North Uist. There are several causeways, easing the passage of traffic across the six islands that carry the road between the northern and southern ferry terminals of the Uists. Leaving Berneray, to reach the main road that circles North Uist, your journey winds its way through crofting land, flanked by small beaches, salt marsh and rocky promontories. Look out for the ruined dun at Loch an Sticir, just by the left turn at Port nan Long. This is a loch where it’s worth quietly hoping for sight of an otter. Lochmaddy is the largest township of North Uist and has a population of about 300. Taigh Chearsabhagh arts centre provides an introduction to the arts, culture and heritage of the islands in a stimulating environment. Take a walk along the shore beyond the outdoor centre, where you’ll find a traditional, turf-roofed bee-hive building, constructed during 1997 and containing a camera obscura. 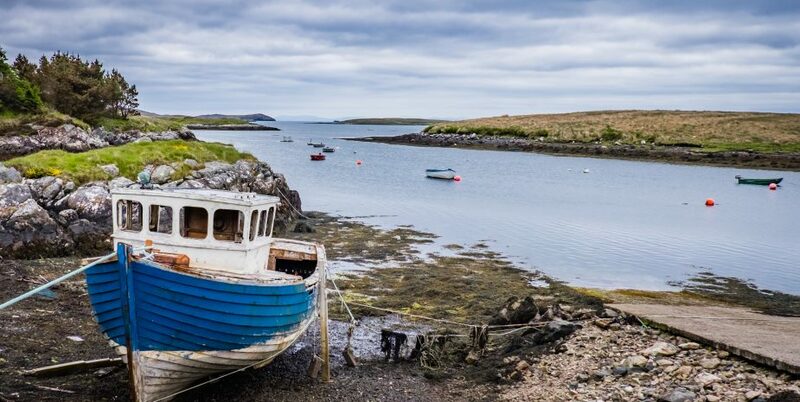 From Lochmaddy, it’s only a few minutes drive across the moors past fishing lochs and peat cuttings, to join the west coast road at Clachan, where Hebridean Smokehouse sells tasty smoked salmon, trout or scallops for a luxury picnic – with bread from the village store. Or stop a little further on at Cladach Kirkibost, where the community centre has a modern shop and cafe – with home made soup it’s an excellent lunch stop – broadband, too. 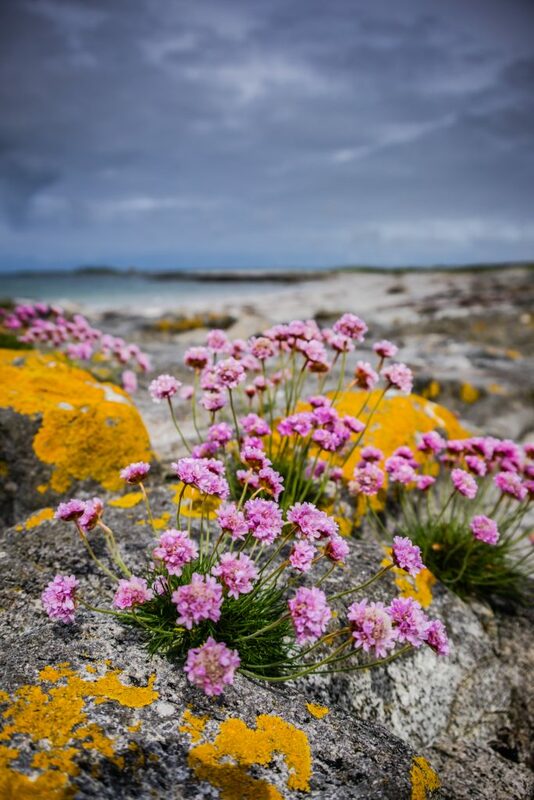 Turn up the west coast road here and pass through several hamlets before reaching the RSPB nature reserve at Balranald – a haven for all sorts of wildlife. The warden also leads a weekly otter walk, at Langass, just east of Clachan. Further on, the shell-sand beach at Balemartin is one of several in this area. You might have it completely to yourselves, even on a weekday in high season. Continue to Malacleit and Sollas on the north coast (more views and walking opportunities) before returning over the moor on the ‘committee road’ from Malacleit back to Cladach Kirkibost. Keep an eye out for raptors, hunting alongside the road, which affords wide ranging views over North Uist. Driving southward again, you’ll cross moorland to a short causeway over the shallows between North Uist and Grimsay. 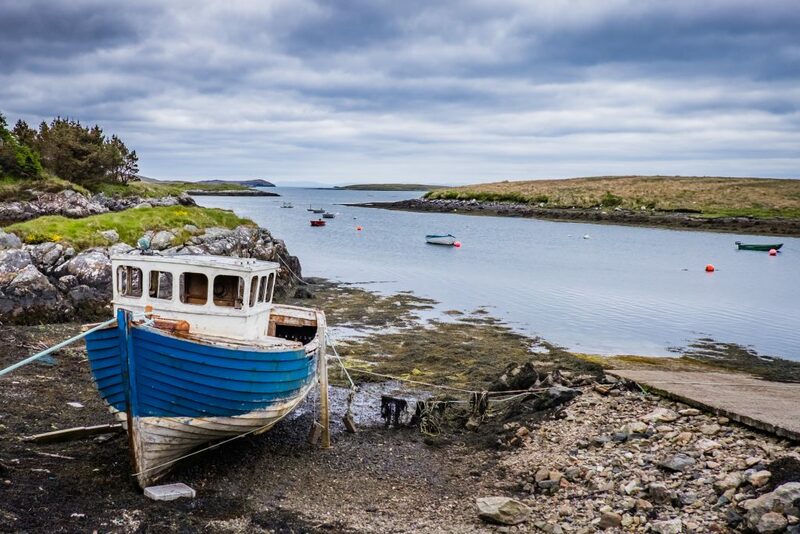 Here, a scenic detour of about 5 miles around the island is well worth while, Look out for the boatshed/museum and for Kallin, where you can buy ready cooked shellfish. This is another area where you may be lucky enough to catch sight of an otter. Beyond Grimsay, crossing a couple of further causeways will bring you to the southern islands of the Uists. 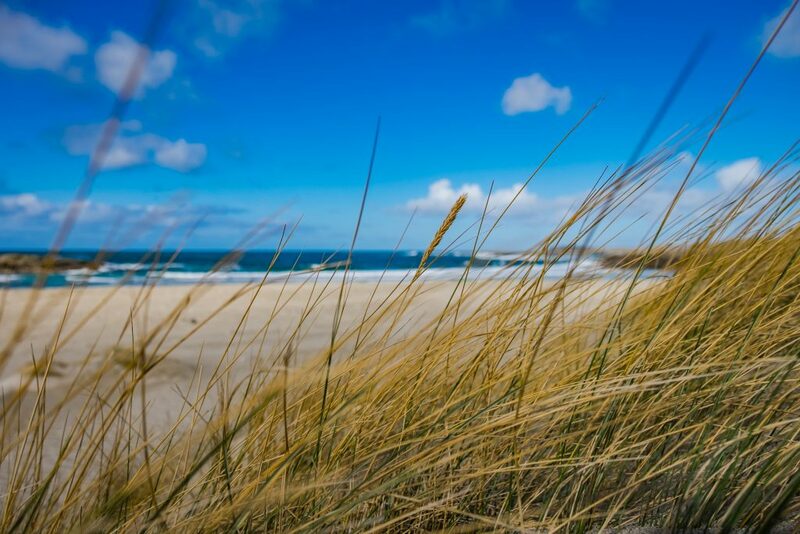 Like all Hebridean islands, North Uist offers plenty of scenery attraction but for some, the abundance of wildlife may be the greatest attraction. More often than not, in other areas you need to be extra vigilant, but here, it sometimes seems like nature is putting on a show for you. 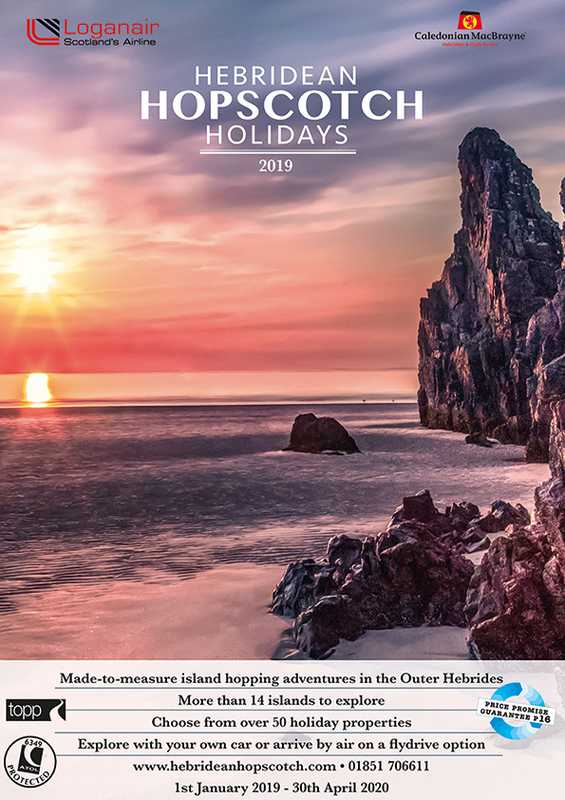 Take a drive along the ‘committee road’ – which crosses the moor and cuts across the north west corner of the island and, in the space of ten minutes or so, you might see Golden Eagle, Short-eared Owl and Hen Harrier, without leaving your car or bike saddle. The western coast road passes the RSPB reserve at Balranald, where resident birds, migrants and those on passage include species rarely seen elsewhere in the UK. Star attractions are Barnacle goose, Corn bunting, Corncrake, Lapwing and Turnstone. The Corncrake despite its noisy nature, is a furtive bird, so you may have to settle for listening to it! Anglers can experience some of the best salmon, sea-trout and brown trout waters in Europe – while non-anglers will find it a great place to buy smoked salmon.